CES 2019 was held this week in Las Vegas and had over 4,500 exhibiting companies and over 180,000 attendees. 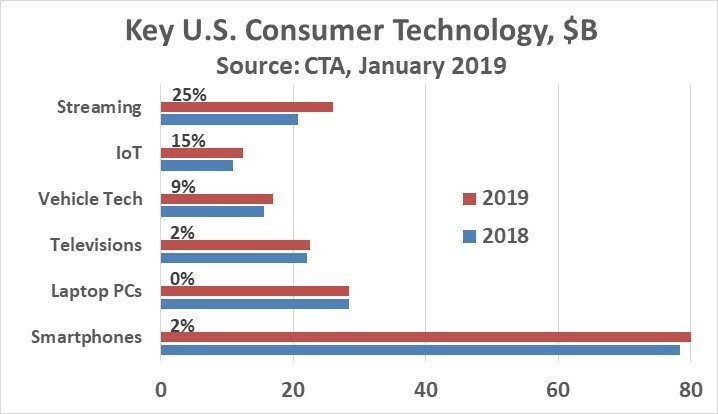 The Consumer Technology Association (CTA) has projected the overall US consumer technology market will hit $398bn in 2019, up four percent from 2018. Much of the total consists of the large dollar but slow growing categories of smartphones, laptop PCs, and televisions. These three categories total $131bn in 2019 but are growing only 0% to 2%. These categories do contain some high growth products. 5G smartphones will emerge on the market later this year and are expected to account for only one percent of total smartphone units in 2019 but should account for 75% in 2022. 8K UHD televisions are also a new category in 2019 and should only account for about 200 thousand of 42 million TVs. Most of the growth in consumer technology in 2019 is driven by emerging categories. Streaming services (video and music) are forecast to reach $26bn in 2019, up 25% from 2018. This category reflects the broader CTA definition of consumer technology to include services as well as electronics. The major Internet of Things (IoT) categories are smart home (home controls, monitoring and security), smart speakers (such as the Amazon Echo and Google Home) and smartwatches. These three categories are projected to total $10.9bn in 2019, up 15%. Another fast-growing category is in-vehicle technology including entertainment, navigation and driver-assist features. Totalling $17bn in 2019, this category will grow nine percent. The emphasis on new consumer technologies was evident at the CES Unveiled media event. The event featured diverse applications such smart plumbing products from Moen and Kohler, numerous smart home products, an automated bread maker, a smart mirror to analyse your facial product needs and a pillow sleep aid. Helite demonstrated an airbag for cyclists. The airbag resembles a life jacket and inflates when the bike crashes - protecting the torso. Although as any experienced cyclist knows, the most common injuries in a crash are to the head (hopefully protected by a helmet), not the arms and the legs. Ovis demonstrated a self-driving suitcase which will follow you through the airport. I guess pulling a wheeled suitcase by the handle is too much work. An innovative product from French company E-Vone is a set of smart shoes which detect falls and notifies caregivers with a precise location. Other solutions require the user to wear a device and push a button when the user needs assistance. The press conferences of the major consumer electronics companies focused on emerging markets. Panasonic emphasised Artificial Intelligence (AI), the IoT and robotics. The company demonstrated two products which use its electric powertrain platform - electric assist mountain bikes from Van Dessel and an electric motorcycle from Harley Davidson. Samsung’s CES press conference did feature its core businesses of smartphones and televisions. It has 5G networks up and running in South Korea and will introduce its first 5G smartphone later this year. Samsung displayed its 98” QLED 8K UHD TV, currently available for pre-order in the US. Samsung spent much of its press conference discussing its AI platform - Bixby - for televisions, cars and appliances. It also displayed a line of robots for healthcare (Bot Care), air monitoring and conditioning (Bot Air), retail assistance (Bot Retail) and mobility assistance (GEMS). Sony's press conference focused on tie-ins to its movie and music businesses. Its cameras, televisions and audio products were discussed in relation to these businesses. Singer Pharrell Williams made an appearance to discuss his visit to Sony’s R&D centre in Japan. Qualcomm began its press conference discussing 5G. The company expects over 30 5G devices (mostly smartphones) will be launched in 2019, almost all using Qualcomm’s RF devices. Most of the press conference was devoted to Qualcomm’s automotive products. The company said 30% of new cars are equipped with cellular connectivity and it expects this to grow to 75% in five years. Qualcomm’s booth was one of the largest at CES 2019 and featured six models of prototype 5G smartphones for China and Europe. Most of Qualcomm’s booth space was dedicated to smartwatches, noise cancelling headphones, and the smart connected car. Intel's CES booth featured laptops using its latest Core i7 8th generation processor. Like Qualcomm, Intel devoted most of its space to emerging technologies such as autonomous driving and immersive cinematic experiences. What does the new emphasis on IoT, AI, robotics and smart cars mean to the semiconductor industry? It marks a new era. The major drivers of the past (smartphones, PCs and televisions) are showing flat to slow growth overall. Two of the largest semiconductor companies are shifting emphasis to the emerging markets. Intel, which gets most of its revenue from processors for PCs and servers, is pushing autonomous driving and entertainment delivered over 5G networks. Qualcomm, primarily a smartphone IC company, is also emphasising automotive and IoT applications. The new era also opens up opportunities for other semiconductor companies to provide devices for the new generation of consumer products. Some of these emerging applications such as smart homes, smart speakers, autonomous cars and even personal robots may become as ubiquitous as PCs, TVs and smartphones over the next five to ten years. OK CES, where are all the women?